Radon testing is easy, affordable and accurate! If your home has not yet been tested for radon gas, the time to act is now! Radon is the #2 leading causing of lung cancer in the USA and is responsible for over 20,000 deaths annually. MidAmerica Basement Systems of Illinois and Iowa offers a convenient, accurate and affordable option for you to test your home’s radon level with do-it-yourself home test kits. Peace of mind. Know your home is protected with expert radon testing. Step 1: Contact us by calling or e-mailing us online.The EPA recommends performing 2 kits simultaneously and averaging the results. This is the most cost-effective and accurate way to test your home yourself. Step 2: Conduct the radon test. Your radon kits will come with some simple instructions that you can follow. Setting up a radon test is easy, and should take no longer than a few minutes of your time. Be sure to pay special attention to the instructions that mention closing windows and doors, and locating the test kit in the lowest area of your home (very often the basement). The testing period for the kits is 48 to 90 hours. Step 3: Mail your radon kits to the lab. Once the data has been collected by your radon test kit, carefully reseal the package and send it to the laboratory specified on the package immediately for analysis. Make sure to fill out all the information on the information card. Within a few weeks, the results of your test should arrive (either by mail or email). Why is this the best option to test? Convenient: You can place the test kits yourself on your own timeline without scheduling an appointment. Accurate: By performing 2 test kits simultaneously you will have an EPA approved radon level score in weeks that you can act on, if necessary. If your results show 4.0 pCi/L or higher, contact MidAmerica Basement Systems for a free Radon Mitigation System estimate. Many homeowners will seek mitigation services even if the results are lower 4.0-- as there is no "healthy" level of radon exposure, and many countries have a much lower recommended action level than the US (for example, the World Health Organization sets the radon action level at 2.7 pCi/L). Radon levels can be controlled by installing a radon mitigation system in your home. Radon Mitigation Systems are affordable and installed in only one day by our highly trained and skilled technicians! Call today for a radon testing appointment or to receive a free radon mitigation quote. 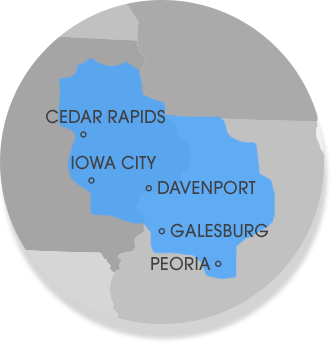 MidAmerica Basement Systems of Illinois and Iowa services Cedar Rapids, Dubuque, Normal, Peoria, Bettendorf, Pekin, Marion, Freeport, Waterloo, Muscatine, Galesburg and the surrounding areas. MidAmerica Basement Systems also provides HUD multi-family radon testing and mitigation. HUD's multi-family radon policy requires that all radon testing and mitigation be performed by a certified radon professional.